AMA: What happened to the CrossGen stuff? What happened to your CrossGen stuff? Soooo… for context, CrossGen Comics was a comic book publisher that ran in the late 1990s and early 2000s. At the time, I was pretty burnt out on Marvel. They offered a great alternative without being too alternative. They were mostly action/adventure tales using similar storytelling techniques seen in superhero comics but they were set in different genre trappings or remixes, like sci-fi, high fantasy, Victorian mystery, kung-fu, etc. 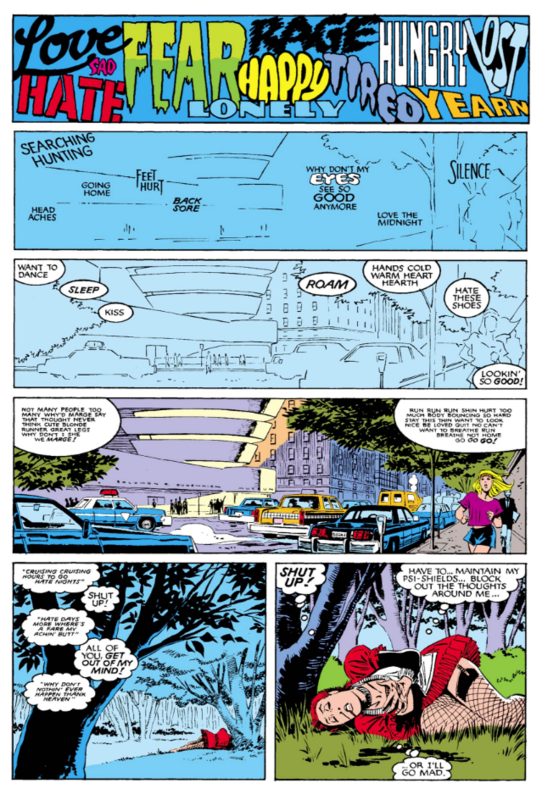 Like Marvel and DC, the comics were all set in the same universe, but to give breathing room, independence and accessibility, each comic was set on a different planet, instead of a different city or part of New York. This allowed a lot of unique world building and stylistic freedom. But because there was some shared mythology and the possibility to visit other planets, it still had the appeal of shared universes. For the most part, this allowed readers to read as little or as much of the publisher’s line as they wanted. When characters did crossover, they were initially very good at presenting it so it held up regardless of how much of the line you read. That unique approach to publishing was already intriguing to me, but to add to that was the unique business model. At the time, and for the most part still today, comic book creators work as freelancers. There will be exclusive contracts here and there, but for the vast majority, comic creators still almost entirely work from home project to project with little job security. CrossGen Comics was bankrolled and led by a comics fan who just so happened to have been a CEO for a previous non-comics company that had been bought. He took a decidedly corporate approach to running CrossGen. Creators were hired full-time to work in the office headquarters in Tampa, Florida. They were given a salary and full benefits like a real full-time employee. This led to a collaborative bullpen, like the mythological Marvel Bullpen. At the same time, the company innovated in how it handled reprint editions to bookstores, establishing a format and release schedule that has become industry standard, and digital comics well before the launch of comiXology. It all sounded pretty exciting, so I jumped right in early on. I bought every book and built a fan-site that tracked each character and their appearances. It was pretty barebones design-wise, and I never got around to actually dressing it up, but it became a good resource for those getting into the company’s universe, especially as it grew. Around the same time, I started writing for the short-lived online resurrection of The Comics Reader (another site sadly no longer online), and interviewed CrossGen’s CEO for one of the first in-depth articles on the nonprofit organization that would become The Hero Initiative. I interviewed several others on the initial board for The Hero Initiative, but CrossGen’s CEO was the most generous with his time. We spoke on the phone and he was very charming, generously sending me a few prints. So what happened? Long story short (too late), the company overreached. The CEO’s ambitions outstretched the limitations of the comics industry at the time. Plus, from what I understand from various interviews, there were some significant clashing of egos at the CrossGen Compound in regards to how much the shared universe elements should play a part in each book. Risks were taken that didn’t pay off. Paychecks started to slow down. Creators started to leave. Finally, they went into bankruptcy. Because of the corporate structure, all of the properties were either fully or partially owned by CrossGen (aside from a few partnerships with other publishers). When the properties went to auction, Disney’s Hyperion Books showed up and bought the entire line just so they could get J.M. DeMatteis and Mike Ploog’s Abadazad, a beautiful fantasy series that riffed on classic children’s books like Alice’s Adventures in Wonderland and The Wonderful Wizard of Oz. The comic was a late entry in the publisher’s output intended for an imprint set outside the CrossGen Universe line. Only 3 issues were published before the company went under. The book was relaunched by Hyperion Books in 2006 as a comics/illustrated children’s book hybrid that sadly didn’t find an audience and was discontinued after the third book in the series. Also in 2006, Checker Books licensed reprint rights to try to get unreleased collected editions to market. At the time, there were rumors of Checker trying to also publish unreleased stories, such as the highly anticipated Negation War. But alas, Checker seemed poorly equipped to really promote the line properly and their production quality couldn’t match the original books. Plus, the bad taste of the company’s end was probably still too fresh. Then in 2009, Disney acquired Marvel Comics, which means that ironically CrossGen Comics is now part of the same company it once wanted to supplant. The following year, Marvel announced a CrossGen revival, and a few mini-series were released in 2011 minus the shared universe element. Historically, Marvel has not done well with marketing non-superhero comics, with the most notable exception of Star Wars, which basically markets itself. So needless to say, that relaunch fizzled. It’s been nothing since. Every so often I’ll get an email asking me about that old site proving that either old CrossGen fans are still out there or new readers are somehow still finding the old books. As I said in the beginning of this post: the internet remembers. I’m still here! I’ll be honest, getting through the Secret Wars II period was a bit of a challenge. But I’m glad I kept going because on the other side of it are some stories that prove there’s still some worthwhile comics with these characters. In case you can’t tell, I’m reading (or in some cases, re-reading) Marvel’s entire Uncanny X-Men series, starting from the original X-Men comic book from the 1960s, through to its relaunch in the 1970s and its rise to the best-selling comic of the 1980s and ’90s until… well, I guess we’ll see. I’m obviously not very prolific, but slow and steady wins something or other. Anyway, I’m up to 1986, right before the very first X-Men event, Mutant Massacre. This batch of issues covers Uncanny X-Men #205 to 209. The standalone Uncanny X-Men #205 is one of the best issues of the era, thanks in large part to the return of extraordinary artist Barry Windsor-Smith. This is his third assignment on the series, previously handling the two Lifedeath stories starring Storm. It seems like a pretty good gig. He gets to show up once a year and really spend the time on creating a beautiful book, leaving the month-to-month grind to others. He provides pencils, inks and colors, which is unusual at the time for an artist on a big superhero book to get such ownership over so much of a comic’s visuals. But it pays off, with an atmospheric and tense story. This may be the most primal and animalistic we’ve seen Wolverine yet, and this is nicely juxtaposed with the innocence of 5-year-old Katie Power, the youngest member of the pre-teen superheroes Power Pack, who first met Wolverine in issue #195. The issue is told from Katie’s perspective for a good portion of the book, which helps present Wolverine as more scary than we’ve seen him. Another nice juxtaposition device is the initial POV on the villain Lady Deathstrike before shifting to the innocence of Katie. I thought Lady Deathstrike first appeared here but apparently she had been bouncing around Daredevil and Alpha Flight for a few months. This is where she adopts the look she will maintain for a long time. The first scene shows her grotesque transformation into a cyborg with creepy fingers that extend out into long razor sharp claws. It’s left a bit vague but Lady Deathstrike believes that her late father will somehow be redeemed by her confronting Wolverine, to the death if need be. “The key is Wolverine, and the secrets locked within his gaijin brain,” she explains in narration. The mystery of his tortured mind and his feral regression depicted here still seem novel at this point but they become more common devices to amp up Wolverine’s cool factor with increasingly diminished returns. Apparently, Deathstrike believes that Wolverine somehow stole her father’s process to bond adamantium to a person’s skeleton. Geez, Lady Deathstrike, how about just hire a patent attorney? After that issue, we return to regular artist John Romita, Jr. where the X-Men are still in San Francisco from the events of the last batch of issues. Freedom Force (formerly Mystique’s Brotherhood of Evil Mutants but with a government pardon and deputized as federal agents) chases them down and actually beats them, wrecking the neighborhood in the process, and only the intervention of local police buy the X-Men time to flee. It’s a decent fight scene but the X-Men fighting this batch of characters is starting to wear a little thin, even with the addition of Spiral and Spider-Woman. The issue ends with Rachel deciding to finally reveal herself to Scott as his daughter but then the next issue the X-Men are back in New York with no mention of that trip. Maybe that scene happened in the recently launched X-Factor? Either way, it’s a bit weak that there’s no follow-up on it in the next few issues, especially considering their focus on Rachel. This era in particular is muddled by too much interactions between books and not enough awareness that people may not be reading every book. Essentially, if you don’t read it or miss the connection, too bad, you’re on your own. Once the X-Men return to New York, recuperating with the Morlocks, they all remember that they’re mad at Rachel for co-opting their life essences to fight the Beyonder during Secret Wars II. This is one of the increasingly odd Chris Claremont ticks where the leapfrog approach to plotting has these delayed responses to things. In the previous issue, it seemed like everyone was fine with Rachel but now everyone’s giving her the cold shoulder. 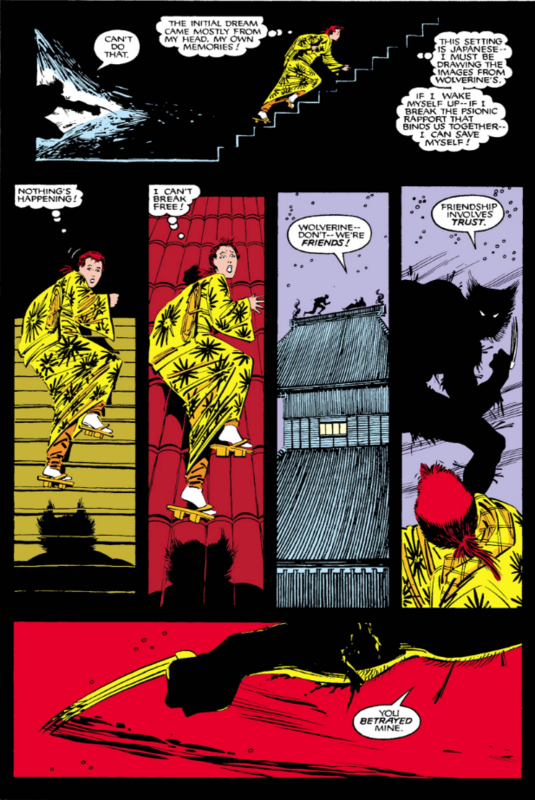 Regardless, there’s some good stuff here, including cool dream sequences (enhanced by Glynis Oliver’s colors) of Wolverine hunting Rachel down as she struggles with her survivor’s guilt and even some suicidal thoughts (echoing Jean Grey committing suicide in the Dark Phoenix Saga). 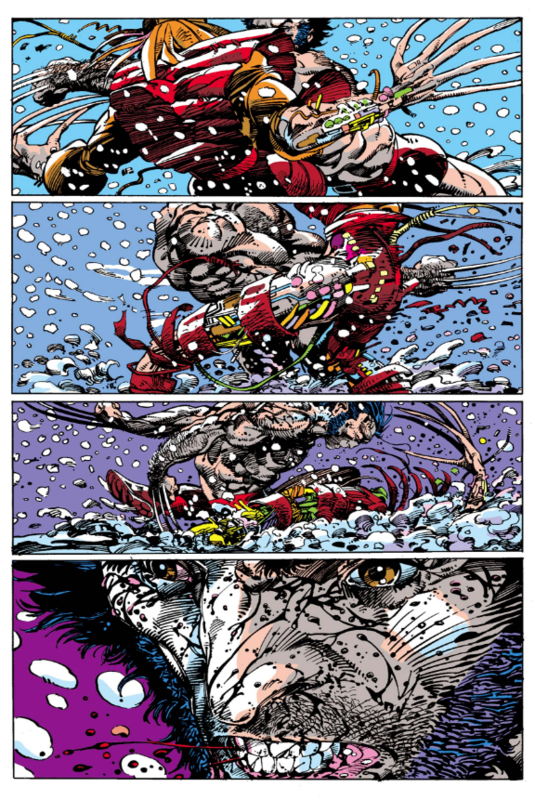 Rachel’s dreams foreshadow the final encounter, with Wolverine, dragging himself out of bed while recovering from his fight with Lady Deathstrike, to try talking Rachel down from murdering Selene. The scene abruptly ends with one of the best cliffhangers the series has had in a long time. The final two issues show the aftermath of that encounter where the Hellfire Club prepares a retaliation and the X-Men and Morlocks search for Rachel. Everyone tracks Rachel to Central Park, and then must also fend off the random arrival of Nimrod, the pink mutant-hunting robot from Rachel’s future. Aside from some goofy costumes (Leland, what are you wearing?! ), there is some really creative moments with the different powers and nice juggling of multiple parties with distinct motivations and objectives. Where the Freedom Force battle was kind of boring, this had higher stakes with better choreographed set pieces. John Romita, Jr., and Dan Green continues to be a good visual storyteller. He’s more interesting in dream sequences and other strange scenes where he seems to give himself permission to be more unconventional. All told, while plotting coordination is slipping, resulting in some uneven issues, this is a mostly decent set of comics, with the Barry Windsor-Smith issue in particular skewing the average up considerably. Next is the first X-Men-centric event: Mutant Massacre! I’ll try to take less than 6 months this time.